This tranquil rural spot was the setting for one of the most horrific crimes of the American War: a massacre committed by US troops that killed 504 villagers, many of them elderly people and children on 16 March 1968. The deeply poignant Son My Memorial (admission 10,000d; 7am-4.30pm) was constructed as a monument to their memory. The war crime was one of the pivotal moments of the conflict, shaping public perceptions in the USA and across the world. As Life magazine put it, ‘the American people reacted to the massacre of My Lai with horror, shame and shock, but also with disbelief ’. Centred on a dramatic stone sculpture of an elderly woman holding up her fist in defiance, a dead child in her arms, the monument rises high above the landscape. Surrounding the main sculpture, scenes have been re-created in peaceful gardens to reflect the aftermath of that fateful day. Burnt-out shells of homes stand in their original locations, each marked with a plaque listing the names and ages of the family that once resided there. The concrete connecting the ruins is coloured to represent a dirt path, and indented with the heavy bootprints of American soldiers and the bare footprints of fleeing villagers. The massacre was painstakingly documented by a US military photographer, and these graphic images are now the showcase of a powerful museum on-site. Inevitably, the content is incredibly harrowing: villagers are shown cowering from troops, there are corpses of children and limbless victims. The display ends on a hopeful note, chronicling the efforts of the local people to rebuild their lives afterwards. A section honours the GIs who tried to stop the carnage, shielding a group of villagers from certain death, and those responsible for blowing the whistle. The road to Son My passes through particularly beautiful countryside: rice paddies, cassava patches and vegetable gardens shaded by casuarinas and eucalyptus trees. However, if you look closely you can still make out the odd bomb crater, and the bare hilltops are testimony to the continuing environmental devastation caused by Agent Orange. The best way to get to Son My is by motorbike (around 120,000d including waiting time) or regular taxi (about 330,000d return). From Quang Ngai head north on Ð Quang Trung (Hwy 1) and cross the long bridge over the Tra Khuc River. Take the first right (eastward, parallel to the river) where a triangular concrete stela indicates the way and follow the road for 12km. At about 7.30am on 16 March 1968, the US Army’s Charlie Company landed by helicopter in the west of Son My, regarded as a Viet Cong stronghold. The area had been bombarded with artillery, and the landing zone was raked with rocket and machine-gun fire from helicopter gunships. They encountered no resistance during the ‘combat-assault’, nor did they come under fire at any time during the operation; but as soon as their sweep eastward began, so did the atrocities. As the soldiers of the 1st Platoon moved through Xom Lang, they shot and bayoneted fleeing villagers, threw hand grenades into houses and bomb shelters, slaughtered livestock and burned dwellings. Somewhere between 75 and 150 unarmed villagers were rounded up and herded to a ditch, where they were executed by machine-gun fire. In the next few hours, as command helicopters circled overhead and American Navy boats patrolled offshore, the 2nd Platoon, the 3rd Platoon and the company headquarters group also became involved in the attacks. At least half a dozen groups of civilians, including women and children, were assembled and executed. Villagers fleeing towards Quang Ngai were shot. As these massacres were taking place, at least four girls and women were raped or gang-raped by groups of soldiers. 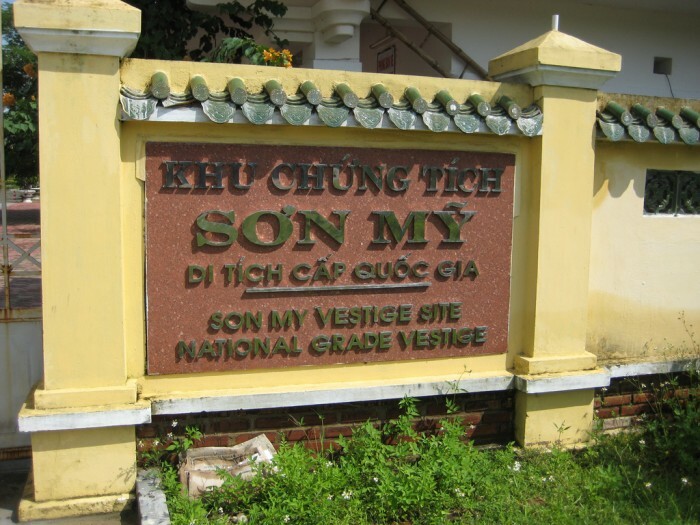 According to the memorial here, a total of 504 Vietnamese were killed during the massacre; US Army sources determined the total number of dead at 347. Troops who participated were ordered to keep their mouths shut, but several disobeyed orders and went public with the story after returning to the USA, including helicopter pilot Hugh Thompson Jr who managed to rescue several women and children on that fateful day. When it broke in the newspapers it had a devastating effect on the military’s morale and fuelled further public protests against the war. It did little to persuade the world that the US Army was fighting on behalf of the Vietnamese people. Unlike WWII veterans, who returned home to parades and glory, soldiers coming home from Vietnam often found themselves ostracised and branded ‘baby killers’. A cover-up of the atrocities was undertaken at all levels of the US Army command, eventually leading to several investigations. Lieutenant William Calley, leader of the 1st Platoon, was court-martialled and found guilty of the murders of 22 unarmed civilians. He was sentenced to life imprisonment in 1971 and spent three years under house arrest at Fort Benning, Georgia, while appealing his conviction. Calley was paroled in 1974 after the US Supreme Court refused to hear his case. The case still causes controversy – many claim that he was made a scapegoat because of his low rank, and that officers much higher up ordered the massacres. What is certain is that he didn’t act alone. For the full story of this event and its aftermath, pick up a copy of Four Hours in My Lai by Michael Bilton and Kevin Sim, a stunning piece of journalism. A world away from the sombre atmosphere of the Son My Memorial, but only a couple of kilometres down the road, My Khe (not to be confused with the other My Khe Beach near Danang) is a superb beach, with fine white sand and clear water. It stretches for kilometres along a thin, casuarina-lined spit of sand, separated from the mainland by Song Kinh Giang, a body of water just inland from the beach. If you follow the golden rule (avoid holidays and weekends) you’ve a good chance of having this pretty beach largely to yourself. The shoreline’s profile is gently shelving so it’s great for children and those not confident in deep water. Accommodation options are very limited. Apart from My Khe Hotel there’s only one other option (and it wasn’t staffed when we dropped by). Dozens of ramshackle seafood shacks are spread along the beach here, although they can be a bit of a hard-sell. Fish and seafood are fresh and delicious, but settle on prices in advance. ( 055-384 3316; [email protected]; My Khe; s/d/tr 320,000/360,000/480,000d) An excellent new place just behind the beach with very smart rooms for the price, all with good quality furnishings, marble floors and flat-screen TVs. There’s an attractive restaurant at the front. (My Khe beach; meals 40,000-100,000d; 9am-8pm) Seafood place that specialises in delicious prawns in sweet chilli sauce, which you barbecue yourself. Order them with a green salad and a beer and you’re set.